I'm not sure when or where it started, but I have definitely been on a major tassel kick for quite awhile now! Whether found on earrings, dresses, or pillows, I don't think I've met a tassel I didn't like. 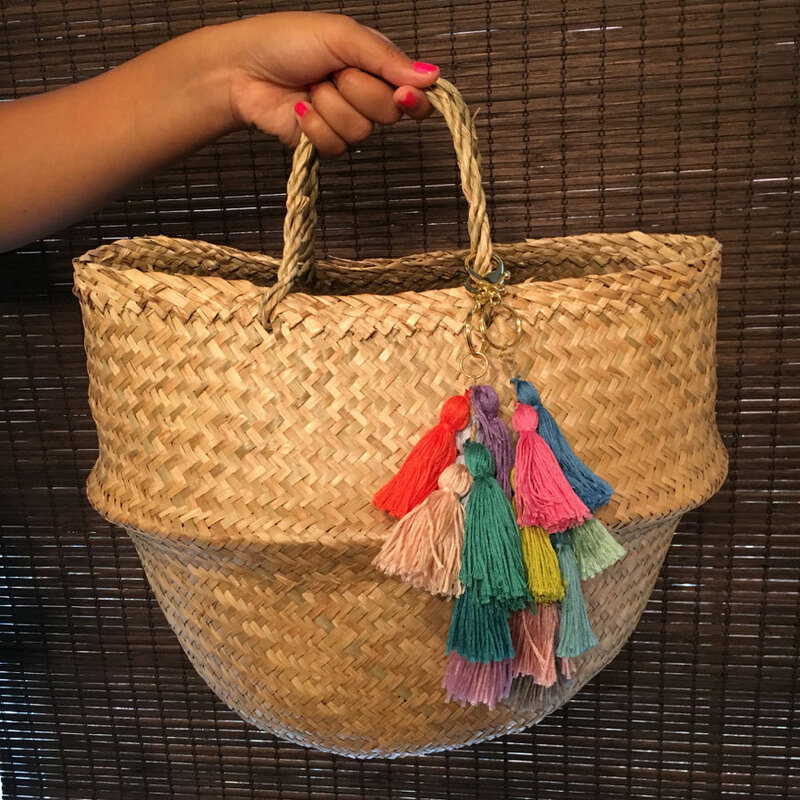 I sell tassel-adorned Turkish towels, so I started using #everydayImTasselin as an Instagram hashtag, and I love seeing some of my favorite tasselers catch on, too! Here is a little round-up of a few products that are tasseled to perfection, with a tassel tutorial at the end in case you want to make some yourself! Some of the links I've shared are affiliate links, which means your purchase will help me keep this blog up and running. I appreciate it so much! I just discovered Cristina V., which is all made in the USA! Her elephant pendant necklace is too adorable! I'm also always into tassel earrings, and while I love Lisi Lerch, they just start to hurt by the end of the night so I've graduated to Bauble Bar's lighter versions. Escapada's clothing makes me want to pack a bag for the Tropics ASAP, but with our surprisingly warm temps lately these are some great pieces for both traveling and weekending at home. How fab is the the Lorelei jacket (in flat lay & top left photo), with precious pink or aqua tassels on every corner. This Cayman pattern is my favorite print of theirs right now, and I own it in the romper version that fits like a dream. I'm loving all of their caftan and tunic styles at EscapadaLiving.com, which help tide us over until summer because meanwhile they pair well with jeans. As promised, here is a tassel tutorial c/o Martha Stewart. You can use with embroidery thread as shown, or even use yarn for big awesome tassel garlands! Pom-poms are essentially made the same way, just with a tie in the center and a cut on both ends instead of one. Helpful tip: it's nice to have a partner for an extra set of pinching fingers!